Moving along through March I’m sure that for many of you, summer camp preparations are starting to dwell heavier and heavier on your mind. There’s so much you need to get before camp starts, so let posts like these help give you a better idea of what you’re getting with our new products. As hot as the days get at summer camp, the other foot always falls and with it, so does the temperature. Chilly nights and rainy days are inevitable; so, Parents, make sure your kids are prepared with the Fawn Grove Throw from Woolrich. This blanket takes the chill out of a chilly night. It is as amazing as they come. You’ll have absolutely no problems staying warm when you cover up with this throw. The great thing about the Fawn Grove Throw is its weight distribution. It’s the perfect balance between a bulky blanket and a light throw. 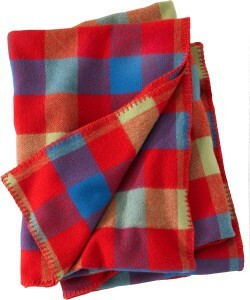 You’re sure to fall asleep as you fall in love with this single-ply, warm, wool blanket. At 54” wide and 70” long, this blanket is certainly big enough to snuggle up in or use for two to share, covering their legs. Whether it’s the stitching around the borders of the throw—a subtle and impressive touch—or simply the soft, plaid design, these beautiful blankets will likely hold you spellbound. That’s how you know the quality is real and definitely made in the Woolrich Woolen Mills. The Fawn Grove Throw is available in a variety of diverse, dreamy colors so make sure you know in which one your camper will want to wrap up. For a sneak peek of what you’re buying, I’d suggest using the zoom feature on our site. It’ll allow you to get real up close and personal with these throws. I think you’ll be happy to find that even extremely close up, the Fawn Grove Throw is the perfect summer camp blanket. Dry clean for best care. And, as always, thanks for reading, Camp Folks!